Clinical studies conclude that Eyeliss, using the newest three peptide technology is one of the most potent treatments to reduce under eye puffiness, working as a cure to effectively treat eye bags. Used in combination with dark circle treatments you can indeed eliminate that shadowy under eye bag lady syndrome! 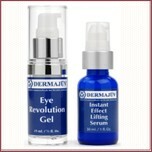 What is it about this new peptide technology that works to reduce under eye puffiness? There are two very specific ingredients that preliminary clinical studies indicate work in concert with each other to not only reduce puffy bags under the eyes but to effectively diminish dark circles and the fine lines that radiate out from the corners of the eyes. on the skin care scene. . . It is the first treatment that has been especially formulated to treat the chronic problem of under eye puffiness. Haloxyl is the second ingredient that specifically targets bruising and dark circles under the eye. Hesperidin Methyl Chalcone is a natural ingredient derived from flavonoid hesperidin found in citrus fruits like grapefruit and oranges. This rather newly discovered ingredient helps to strengthen capillaries and veins as well to improve lymphatic drainage and circulations which tones the delicate under eye area. Dipeptide Valyl-Tryptophane is a peptide that promotes the drainage of fluid that collects under the eye creating bags and puffiness. Lipopeptide Pal-GQPR is another peptide that decreases inflammation, improves skin elasticity and firmness, and reduces fine lines and wrinkles. Eyeliss is formulated based upon advanced peptide technology which clinical studies demonstrate works effectively to reduce under eye bags and puffiness by 70%! Clinical studies conclude that this tri-peptide formula is one of the most potent treatments on the market today that effectively addresses that frustrating problem of under eye puffiness. 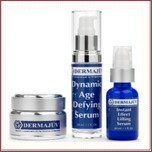 The Dermajuv Facial Rejuvenation Skin Care Line incorporates a powerful concentration of these active anti-aging ingredients in not only their highly specialized treatments to reduce under eye puffiness and their dark circle treatment but in all of their companion aging skin care products as well. Reports further indicate that when these key ingredients are formulated together in combination like the Eye Revolution Gel does, you now have a product that is specifically targeted to treat two of the most chronic under eye issues; eye bags and dark circles. It's the aggressive combination of the ingredients Eyeliss, Haloxyl, 3% concentration of Matrixyl, and stem cells that work in concert to produce results. 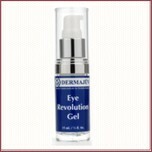 Studies demonstrate that the Eye Revolution Gel achieves significant improvement in not only helping to reduce under eye puffiness but also in diminishing dark under eye circles as well as improving fine lines and wrinkle depth. Use coupon code SKINSATIONAL at check-out for a discount on your entire purchase! the under eye bag lady syndrome include. . .